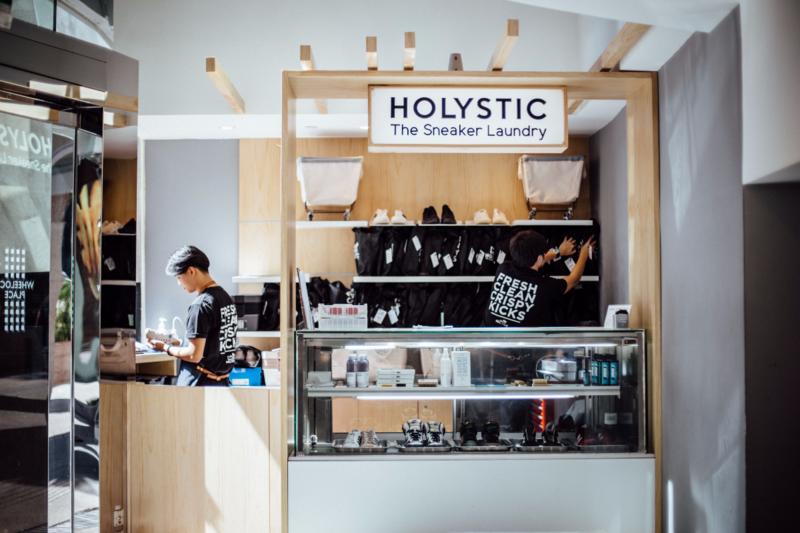 Doyenne: How long have you been with Holystic Sneaker Laundry for? Andrew Lee: Since it started in mid-march this year. Quite recent. It’s only about 4-5 months old. D: It (being a sneaker technician) isn’t a normal occupation at all. There’s no sneaker technician on lists! D: So before you were a sneaker technician what were you doing? Are you part-time or full-time? AL: I actually just came out of the army. I started out as a part-timer in March till mid-April then I became a full-timer. D: Have you always liked sneakers? AL: Been awhile. Maybe 4 years or so? D: So it’s really out of passion that you’re a sneaker technician? Your parents are okay with it? AL: I’m this company mainly out of interest. They tell me if it works out then it works out, but if it doesn’t then you’ll have to find a backup plan. Because it’s a new job also and new jobs come with risk. D: How did you find out about the Sneaker Laundry? AL: My friends had spread the message around and so I joined and I interviewed with (Holystic) for a part-time position at first. I wanted to see how it was like first before I committed full-time. Before the company started I was already washing sneakers on my own. I learn from tutorials online. And then there was a job about being a sneaker technician and I decided to try it out. D: What kind of sneakers did you wash? AL: Generally all my sneakers that come from different brands like Nike, Adidas… Like Adidas UltraBoost, NMDs… For Nike, I lean towards the basketball sneaker series by Kobe Bryant. I’ve a few of those models. D: In 3 words how would you describe your relationship with clean sneakers? AL: Challenging, gives satisfaction and enjoyable. I’d say it’s challenging because all sneakers come in different shape and material. Normally when you wash, some stains are able to come out and some don’t. The tougher stains are glue and grease stains. Easiest is mud. It is satisfying because you restore a sneaker from a beat up condition to almost brand new. The satisfaction will be there. There are some that are really dirty and trashed up and you don’t expect it to become so white and clean. Once in awhile these kind of things are a confidence booster. D: You’re washing sneakers, and the market has so many sneakers on offer, so how? Will people buy more sneakers or invest in sneakers? Like wearing it until it dies? AL: The sneaker market right now is very strong in a sense that people tend to spend more on shoes. Generally they may want to learn how to clean or send their shoes for cleaning more often. Nowadays times have changed where people get a pair of sneakers for a hundred dollars, wear for 2 years, and throw away. Nowadays, they want to keep and preserve it. D: For the sneakers you’ve received and wash so far, what’s the average price range? And what brands are you seeing? AL: I’d say $100-$200? And mostly Nike or Adidas. Slightly more Adidas because of the NMD hype. D: Before you became a sneaker technician what were you doing besides army? 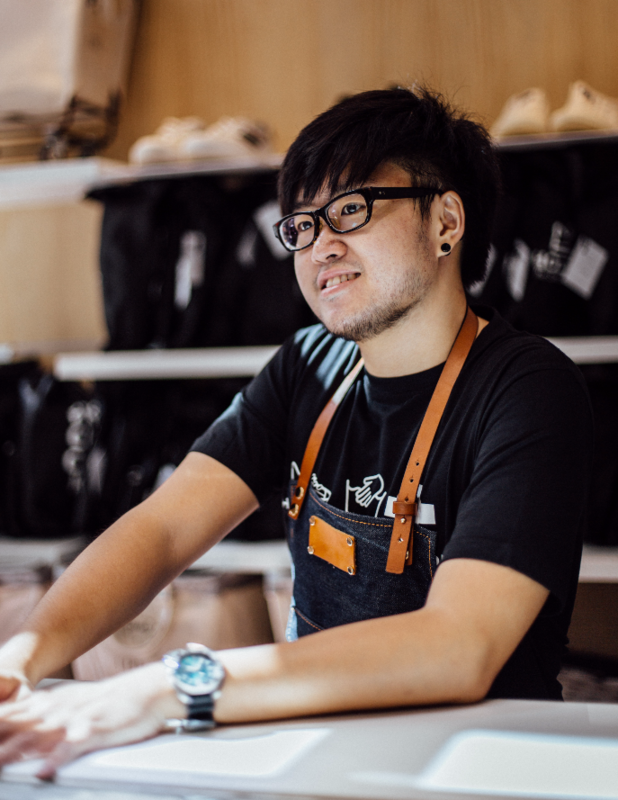 AL: I studied retail management at Temasek Poly. 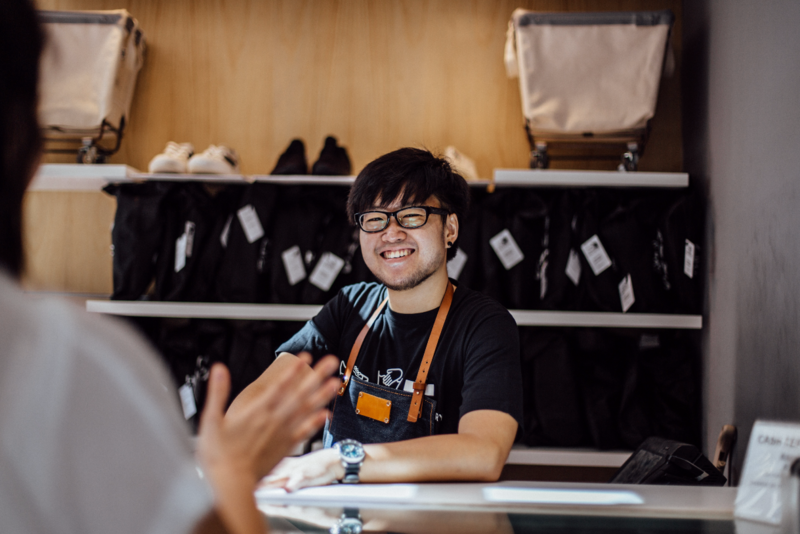 D: As a sneaker technician what do you worry the most about your job? AL: The worst is failing to meet a customer’s expectation. Some customers expect their shoes to turn out almost brand new. Even though we emphasise that some stains really can’t be removed, they still won’t be satisfied. D: Why are you so passionate about sneakers? AL: Sneakers are something I’m willing to spend more on compared to clothes and bags. I started to feel this way because I started playing basketball also. The American culture has shaped a lot of how sneakers come out these days. Way back they used to look like Converses but nowadays they’re so different in their colours and aesthetics. D: What was the most expensive pair of sneakers you’ve ever washed? AL: There’s a full leather pair of Valentinos. I think it was around $2,000. Male shoes. The fear of accidentally damaging the shoe would be at the back of my head sometimes. It came to me dirty with a little bit of cuts and tears. When we washed we had to make sure we didn’t enlarge the cuts or tear the paint. D: When you wash what kind of tools do you usually use? AL: Normally we have a set consisting of a premium brush, a soft, hot-bristled brush used to clean the uppers. Secondly, an all-purpose cleaner brush, which is made of PVC and used to clean the underside and midsole of the shoe. Then we also have a toothbrush to access harder-to-reach areas. We also use Jason Markk solution. It’s a solution that isn’t harmful for shoes and isn’t has soapy as detergents or hand soaps that people use. We hardly receive leather shoes so we don’t really shine them. But if the shoe looks like it needs a shine we’ll give it one. D: Since you joined, how many sneakers have you cleaned? AL: 300-400? We’ve got over a thousand pairs since day 1. 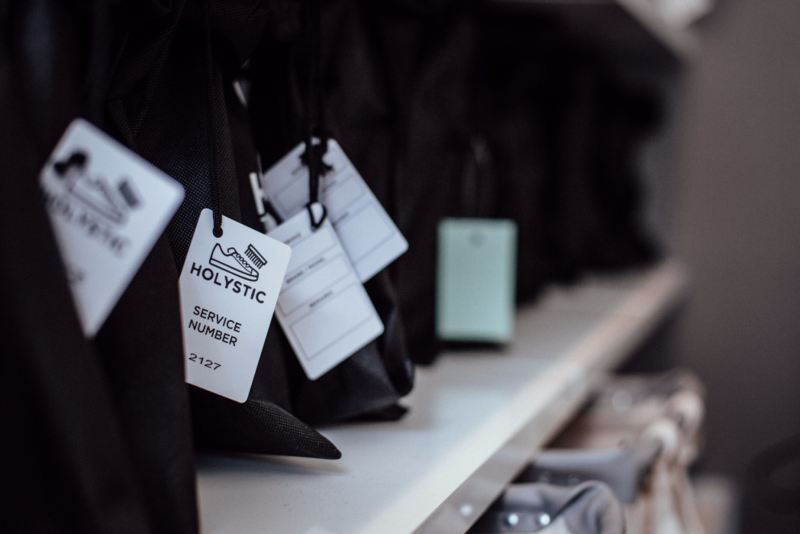 On a daily basis, we’d wash an average of 10-15 pairs. Depending on the shoe, we take about 45mins to 1 hour for each pair. 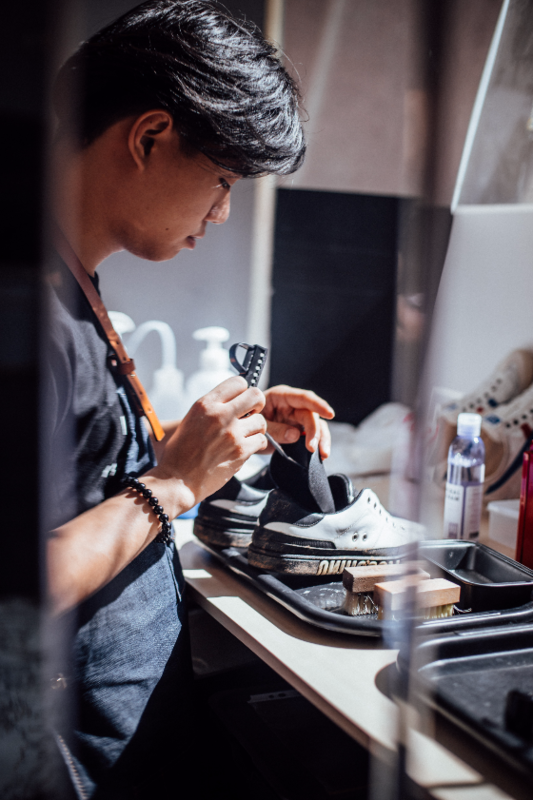 D: Can you describe your typical day as a sneaker technician? AL: We actually have a studio. We only wash urgent pairs here [Wheelock]. There are some customers who drop their sneakers off in the morning and want them back by evening. There’ll be an express charge but we’ll wash it and hope that it dries in time. So anyway we’ll step into the studio and start discussing together solutions for the tougher pairs. We’ll pick who wants to take on the tougher pairs and then we’ll start washing. I wash from 12pm till about 8pm. D: How many sneakers do you have? AL: About 20 pairs? Nike, Adidas, Puma… I’m not a big fan of converse and superga. Haven’t touched any fashion brands yet but may have in the future. D: Do you think you’ll be here (Holystic) for a long time? AL: If everything goes well I’ll stay as a sneaker technician for a while. I really can’t give an answer about the future but for now, I’m staying put. D: It’s better than being a cobbler la. AL: Yeah some people when I mention that I’m a sneaker technician they are like “Huh? Shoe cleaner?” We’re not really a shoe cleaner. AL: For me there are two important things: the design and comfort. The design could be very nice but if you wear it and it feels like you’re walking on bricks, then maybe not. D: And when it comes to performance (how high one can jump/how well one can run)? AL: When it comes to sports, performance (of the sneakers) is a big factor. But for casual wear, its not really an important factor. Mainly the design and comfort. D: If your 15 year old self could see you now what would he think? AL: I think he’ll be amazed and shocked. D: And if your 50 year old self could see you now what would he think? AL: I think he’ll be contented that at least I tried this rather than let it pass by. D: Are sneakers the best footwear anyone could have? AL: Depends. You wouldn’t wear a sneaker to a gala dinner. But I’d say that [generally] sneakers are better footwear because they’re more comfortable compared to boots or loafers. D: For a lazy person, how can he/she care for her sneakers on a daily basis? 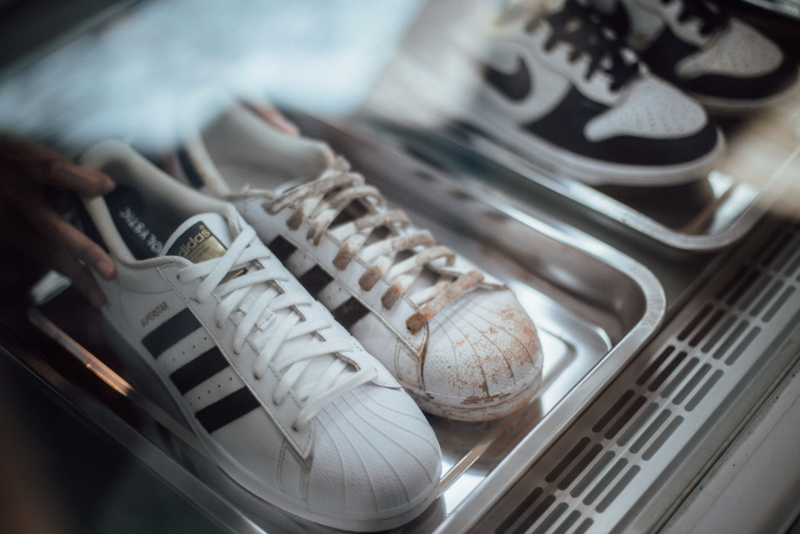 AL: They can take care of their sneakers by giving them a quick wipe once in awhile and not leaving stains there for too long. Wet tissues can be used to clean the exterior stains. But if you’re even lazier you can just drop them off here. D: How long can good pair of sneakers last? AL: Depends on the wearer. Some people don’t really bother and kick here and there. But if you maintain it well, I believe they can last 3-4 years. I still have my first pair around and it’s about 4-5 years old. It’s in a very beat up condition but still wearable. D: Any other things you’d like to say to our readers? AL: Maybe readers can use a shoe tree to keep the shoe in its proper shape. And it prevents creases to a certain extent as well. D: How about people who are keen on becoming a sneaker technician? AL: You can’t just view this position as a day-to-day job. You must really like what you do.